Holy Faith Sisters » Good news from New Orleans! 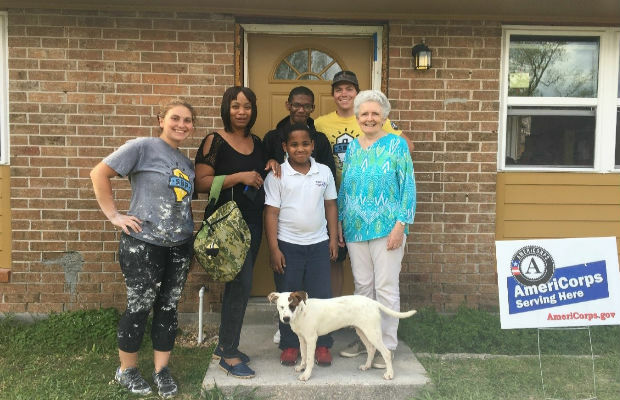 To mark fifty years of ministry in 2017 the Sisters of the Holy Faith, ministering in the Louisiana area initiated an effort to raise some funds to help bring a Katrina impacted family home. Margaret Aylward the foundress of the congregation in 1867 displayed extraordinary gifts of practical enterprise on behalf of the underprivileged of her day, initially as a Lady of Charity of St. Vincent de Paul, and later as the foundress of the Sisters of the Holy Faith. The present Holy Faith Sisters serving in Louisiana felt the call to continue in this practical spirit of Margaret Aylward. We partnered in our initiative with SBP together with the Dominican Sisters of Hope and the Tucker family of California in raising the necessary funds to repair the Andersons’ home. We thank our sisters, associates and friends who generously helped us in this anniversary project. You have helped to comfortably re-house one Katrina impacted family. May you be blessed.